There is a deep sincerity somewhere in the middle of rap battle drama Vs., the directorial debut of short filmmaker Ed Lilly, which isn’t necessarily a groundbreaking fact seeing how there have been films like this before – most notably Eminem vehicle 8 Mile – which have incorporated raw emotion into a story where people spit lyrics at each other, but this film tackles a deeper, more sentimental approach that explores the damaging conditions that a child in the care system can experience; there just also happens to be mad rhyming skills in it as well. The film is about Adam (a debuting Connor Swindells), a foster child on the brink of adulthood who has been passed around from home to home, ever since being placed in the system at age 5 by his mother (Emily Taafe), a teenager herself when she had him. After his latest stay in a foster home ends in violence, Adam is taken by his social worker Terry (Nicholas Pinnock) to a new residence in Southend, under the roof of retired foster parent Fiona (Ruth Sheen). Soon after arriving, Adam meets arcade worker Makayla (Fola Evans-Akingbola), who invites him along to a rap battle event that she is moderating. There, he discovers a natural talent for spitting rhymes, and with Makayla’s help he starts to develop his skills and eventually begin competing in local events – but when he unwittingly comes into contact with his birth mother, it opens up a new hole in his already-fragile state, soon causing things to go off the edge for him. The film is a solid debut by Lilly, who co-writes with debuting screenwriter Daniel Hayes, as it brings a fresh voice to a plot that otherwise contains plenty of tropes you’ve seen in other movies about young underdogs, not just 8 Mile but also Rocky, the latter especially so in how he stages the rap battle scenes like boxing matches, only here no punches are almost never thrown; instead, the pain and bruising comes from the competitors’ unfiltered and entirely lyrical roasting of each other, with nothing – not even the surprisingly open facts about Adam’s foster history – considered off limits. While the lyrics themselves are nothing short of impressive, although one wonders how much of it was scripted or entirely improvised during filming, where Lilly really triumphs with this template is by giving the story, and by extension its lead character, a heavy emotional weight that reflects on a very troubling foster system and the negative psychological effects it can have on a young person. Swindells, who is absolutely wonderful in his debut performance, has to deal with so much stuff in this movie, from having to confront the woman who gave him up as a child (in scenes that are pretty powerful, including one in her place of work as a hairdresser that packs as heavy a punch as any of the numerous rap battle sequences in the film) to trying to navigate life on his own terms as he creeps closer and closer to becoming a legal adult, and you can feel the anguish and frustration all over his skin as he endures one wrong turn after another, with any outburst seeming like it could come at any given moment. I have cousins who act as foster parents, and have also known people who have been through the system themselves, and while they have not – to the best of my knowledge, anyway – dealt with as difficult a foster child as Adam is introduced in this movie as being, they have seen first-hand the psychological damage being moved from one place to another throughout childhood can have on someone in that vulnerable position, and though it can be upsetting there is always room for them to be loved in ways they perhaps haven’t experienced before. In that regard, I think this movie would play interestingly with young people in a similar position, as it doesn’t shy away from how angry and confused it can leave someone with enough memory of their biological family to wonder why they were given up at all. The film does a lot of things which are to be expected in an underdog tale like this – there’s even a brief training montage before the big climactic showdown between Adam and aggressive reigning champion Slaughter (played by grime artist Shotty Horroh) – but it also plays around with a few of these tropes that are also a bit more welcome. The main relationship between Adam and Fola Evans-Akingbola’s character Makayla at first seems like it’s going to be another one of those where at first they’re just friends but eventually become something more, but then some later reveals about her character and another one of the rap battlers kind of turn that plotline on its head, and instead their relationship becomes something a bit more modern and realistic in this day and age. There’s also some interesting revelations about Slaughter having fathered a child with another woman, both of whom he wants barely anything to do with, in an interesting parallel to Adam’s own situation except it seems very unlikely that the woman in question – played by striking newcomer Ellie James – is going to place her own baby into the foster system, which is exactly what his mum ended up doing. As corny as it may sound on paper, Adam does briefly try and prevent the same mistake from happening again by telling her not to give up on the child, in a sincere moment that once again shows how powerful the negative psychological effects of being placed in said system can be on any child, no matter what age they are. Though this isn’t necessarily the kind of film I would actively seek out on my own terms again, I’m glad I was able to experience Vs. on the big screen, since it deals with some heavy topics in a meaningful and respectable manner whilst also diving into some formulaic but reliable tropes at the same time, something I was glad it did because at the very least it ensured I had something to talk about during this review. 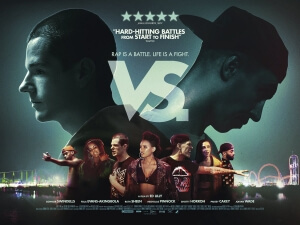 Vs. is a solid feature debut by Ed Lilly which contains a good amount of rap battling, but a heavy focus on the negative psychological effects of being placed in the foster system and a stunning central performance by young Connor Swindells makes it a little bit more than just the UK version of 8 Mile.